If you are a regular guest at Sidewalk Chef Kitchen, you’ve probably noticed a recurring item on our Fresh Express menu – kitcheree (also spelled kitchari). This traditional Indian dish is made from a mixture of dhal, basmati rice, and Indian spices and has a variety of health and digestive benefits. At The Kitchen, Chef Shashank Agtey uses a blend of turmeric, garam masala, ginger, cumin, and other spices in his house-made kitcheree. Kitcheree is an excellent food for detoxification. The ingredient dhal (also spelled dal) is a type of split lentil that is easy to digest while being high in protein and complex carbohydrates. This provides the body with energy and satiety. Basmati rice is also an easily digestible ingredient. The added Indian spices provide vitamins, minerals, and nutrients while also encouraging proper digestion. You can find references to kitcheree dating back thousands of years. It is a staple in Ayurveda, one of the world’s oldest holistic mind-body health systems developed in India years before modern medicine. The perfect combination of vegetables and spices is said to provide balance for the three bodily doshas – which are the energies that define every person’s makeup. Being aware of your dosha can help you live a healthier, more balanced life. 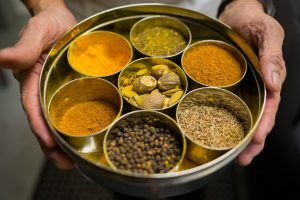 The menu at Sidewalk Chef Kitchen is unique because Chef Shashank Agtey incorporates traditional Indian ingredients into his cooking which creates unique flavors and healthy dishes. Next time you stop by The Kitchen for lunch, be sure to try Chef Agtey’s house-made kitcheree on the Fresh Express menu.